One of the staples I always buy from Costco is the Smucker’s Strawberry Lemonade. Unfortunately for me I haven’t been able to buy any for quite a while. That’s because it is a seasonal item, usually only around in the summer months. I tried to stock up last year, but apparently didn’t buy enough, because I ran out by December. If you haven’t tried it you should give it a shot, it makes a tasty and cheap drink. I am not a fan of drinking plain water. In my opinion, this Strawberry Lemonade is much better than the Country Time Lemonade they carry year-round. And if you do buy it and like it, make sure to stock up. I am thinking of buying 4 cans at the end of summer. Click here to get it right now! Can you please tell me if Costco’s will continue selling your strawberry lemonade in the summer time. Also have you ever decided to bring back your Smucker’s Peach Tea. I miss being able to purchase the Peach Tea. I called Costco’s today to find out if they still carry the strawberry lemonade and was told they no longer carry it, what a surprise to hear that they no longer carry that item. Please let me no where can I buy the lemonade at. This is one of the problems I have with Costco. I am a small business owner and have become quite dependent on the Smucker strawberry lemonade. My customers love it. Now they have decided to no longer carry it. As far as I have been able to determine, Smuckers made it by special order only for Costco. It is no longer available. Thanks Costco. This is the second time you have done this to me. Hopefully I will learn my leson this time. Iwent to a large luncheon today and lemonade was a choice.I tried some and it was the best I’ve ever tasted.I was told it could be found at Cosco.Absolutely delicious.Will join costco just to get the lemonade.If discontinued I will be extremely dissappointed. I think it will likely be back for the summer. We will see soon enough. 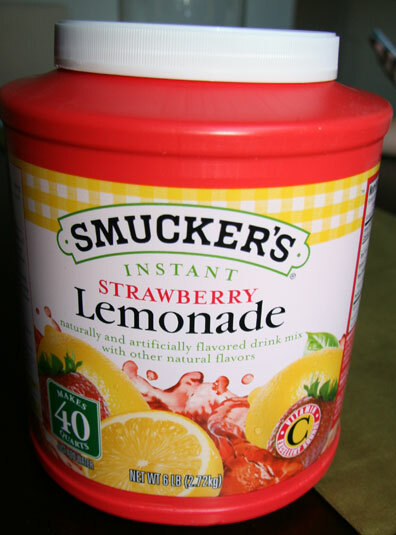 My Mom got me hooked on this Smucker’s Strawberry lemonade. She called San Mateo Costco and requested they get it and the next time she went it was there. She got me 2 and herself 3. Go get it while you can. YUMMMMMMM! Yes, it seems to be back in most stores for the summer. Definitely get it while you can! Yea this stuff is addictive. I used to buy it at Wal-Mart then they stopped carrying it. I haven’t been able to get it in a couple of years. Can’t even find a place online. It taste way better that country time’s version. It is back. It is currently at our local Costco at least. Spring has sprung.